In addition to their October 5-7 performances, BANDALOOP is a participant in the Creative Fellowships Initiative, an interdisciplinary pilot project at the University of Washington exploring the nature of creative research. In August 2017, BANDALOOP spent a week in residence at Meany Center, time dedicated to the creation of Strings. We caught up with BANDALOOP founder Amelia Rudolph while they were in Seattle to learn more about their experience. What was the genesis of BANDALOOP? BANDALOOP is a dance company that is the result of me being a dancer my whole life, and then starting to rock climb. When I was climbing, I began to wonder what would it be like to dance in the mountains. For the past 25 years, I’ve been answering the question: How does the technology of climbing allow you to move in different ways? Tell us about your weeklong Creative Fellowship residency at Meany Center. I’m actually able to be working on and finishing pieces of Strings. I came with 83.2% of the piece done…or something like that. We are finishing the piece, and we are discovering. I had ideas that I needed to have the theater to even try. So I am literally creating the finale moment this week, from scratch, from my imagination, using all the resources that are available this week. Strings will have its premiere here at Meany Center. What is the focus of this new work? I’m really excited about the new piece, Strings. It’s a collaboration with a composer from the U.K., Gabriel Prokofiev. He has this amazing ability to pull from the old Russian world that his grandfather came from, and also include a contemporary sound that is driving—almost like sounds from a club. 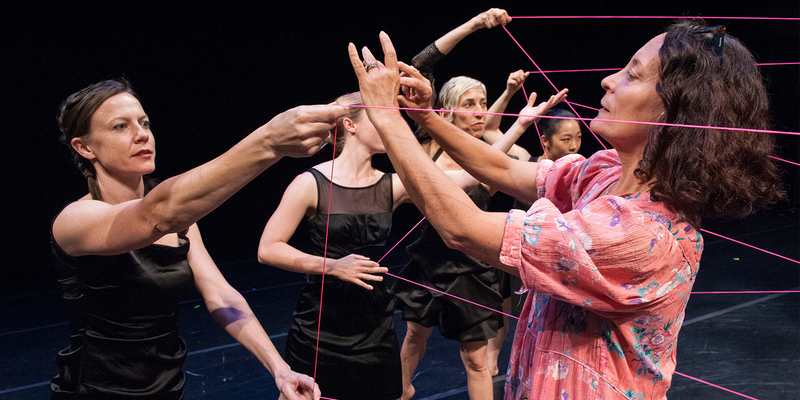 The piece is about the various ways we experience connection. It’s about the invisible strings that hold us together. It’s about how our relationships tug on us and enclose us or set us free. That is represented in the choreography itself—sometimes the strings are invisible, and sometimes they are literal rope and string. How has this fellowship at UW advanced your creative process? One thing that this fellowship has offered me is an invitation to fail. An invitation to take some chances, artistically. When I first started working on the piece in the studio, I said to myself and to the dancers: “We are making nothing. We are investigating, we are playing, we are trying things.” And that gift was just incredible. I do get to do that kind of investigation in my own work, but not often enough, and there’s something about getting funding that specifically asks you to delve into process and really take a moment and be in the tangle of it. In a way, that’s the biggest gift.